What Are SnoreBand Nasal Strips? Nasal strips are only suitable for nasal snorers. They do not work for everyone due to the differences in nose anatomy and the root cause of snoring. They do not constitute a permanent solution and cannot help with persistent snoring problems caused by more severe underlying medical conditions. 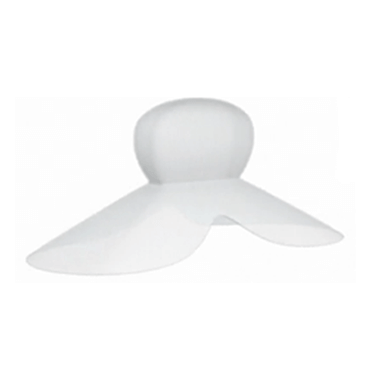 They are not suitable for mouth snorers, throat snorers, individuals with extremely sensitive or irritated skin, snorers allergic to adhesives and latex, and children under the age of 5. Everyone who is a “serious” snorer knows very well that this problem goes way beyond inconvenience or embarrassment. It’s a health issue that reduces the quality of sleep and therefore the quality of life. Those who snore heavily and regularly feel exhausted in the morning, their throat is sensitive and achy and those around them are also greatly affected. 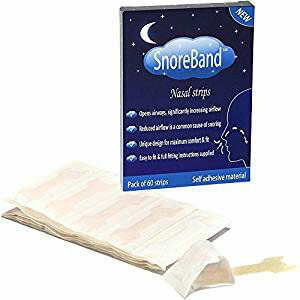 Fortunately, there are some terrific snoring aids on the market out there right now and our SnoreBand Nasal Strips review will explore the details of one of them. 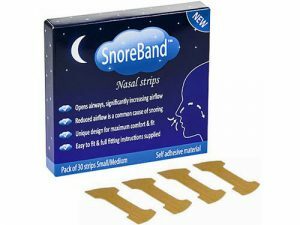 SnoreBand Nasal Strips are snoring strips that you apply to the bridge of your nose before bedtime. They are disposable, which means you will have to use a new strip each night. These strips feature a tiny plastic band or bar that acts like a spring in a way. When you apply the strip to your nose, the band pulls your nostrils open, allowing for normal, natural, and regular airflow as you breathe in and out. When the nostrils are collapsed or nearly closed, the air cannot flow normally, which results in snoring. SnoreBand Nasal Strips address this problem directly. SnoreBand Nasal Strips feature a unique design that is supposed to assure maximum comfort and fit. 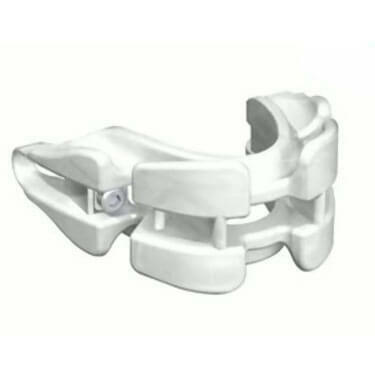 The material is comfortable enough and the strips do not cause any significant side effects. SnoreBand Nasal Strips are ideal for those who do not want to wear a mouthpiece for whatever reason. They are very light and convenient and you can take them anywhere with you. They are easy to use and do not require any particular fitting. The strips come in different sizes and in different quantities, so you can choose an option that suits your needs perfectly. The best part is that SnoreBand Nasal Strips are suitable for just about anyone. Another thing that sets them apart from other snoring devices is the fact they can even provide some relief from nasal congestion caused by allergies and cold. SnoreBand Nasal Strips are very easy to fit and wear. In fact, they do not require any particular fitting. It’s important to choose the right size, though. They come in two sizes – small/medium and large, so make sure to pick the right one. Before applying the strips, it’s important to clean the face, especially the area around the nose. If there is any greasy residue on your skin, including makeup, cream or lotion, the strips will not adhere properly and may fall off in your sleep. Follow the instructions provided in the package: remove the plaster backing and place the strip across the bridge of your nose. You will feel a slight pull as the band tightens and holds the nostrils open. Press with your fingers to make sure it sticks properly. To remove the strip, pull one side gently until the entire strip is off. You can use water for easier removal, too. The price of this snoring aid depends on the type of package you choose. The pack that contains 30 strips costs $12.95, regardless of the size. The 60-strip pack is $23.35 and the package with 90 strips, which lasts three months, costs $33.75. 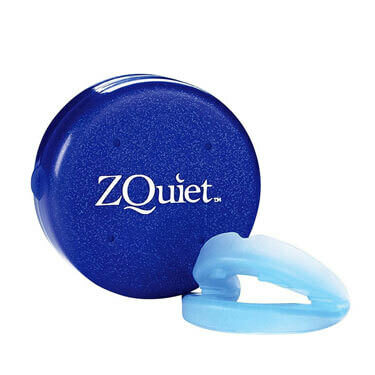 You will notice that this is significantly cheaper than most other snoring aids. However, you will need to purchase them once in one, two or three months. If you are still unsure if SnoreBand Nasal Strips is right for you, check out the key advantages and flaws of this snoring aid. 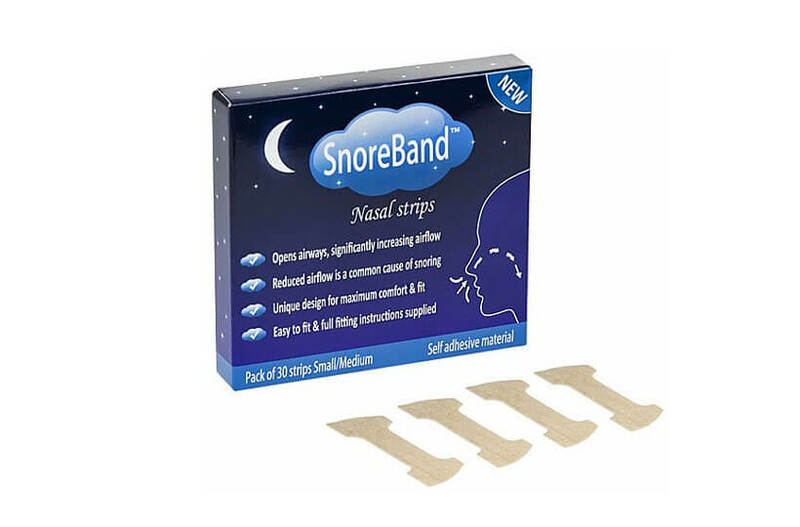 SnoreBand Nasal Strips are among the best anti-snoring strips available. They are quite effective at stopping snoring, which is the most important thing, of course. They are definitely easy to use and, more importantly, they don’t cause any significant side effects like jaw pain or teeth misalignment and damage. We hope our SnoreBand Nasal Strips review helped you make a good choice in your battle against snoring, allowing you to finally get a good night’s sleep. Our ratings are the result of an objective and independent evaluation of SnoreBand Nasal Strips, generating the final rating that reflects the overall quality of the company. Ratings may change as the product introduces changes. SnoreBand Nasal Strips user rating based on 4 user reviews. I've been using these trips since my second surgery for my sinus problems. In the meantime, I somehow developed an allergy to the adhesive and started having adverse reactions every time I used it. I tried cleaning my face and drying it completely before sticking it on my nose but the outline of the strip is still showing up to 10 hours after I remove it. Bottom line, I WANT to use this product so badly since it definitely helps but need to stop, at least for the time being. Works just fine. It opens up my sinus passage as I'm sleeping and definitely helps me breathe better throughout the night. The only thing that bothers me is that it leaves a bit of sticky residue every time I take it off and it's a real pain to wash it away. Still beats my congested nose from the past though. Sometimes these strips feel a bit tight on my nose and there might even be a bit of redness. They work well, though. I prefer using nasal strips to any other kind of anti-snore device. They simply feel better. SnoreBand is a good brand, although they could improve the quality of the adhesive, it falls off easily. We found 0 verified SnoreBand Nasal Strips discounts for April, 2019. There are no SnoreBand Nasal Strips coupons or discounts right now. In order to be sure that SnoreBand Nasal Strips truly is the best solution for your snoring troubles, you need to know what makes it superior or inferior to its alternatives. Discover how SnoreBand Nasal Strips compares to other popular snoring aids of its kind with our detailed feature and price comparisons and easily determine whether you are making the right choice.